INVESTIGATIONS.COM respects the privacy of your personal information. We ensure that we will never disclose your personal information to any third parties, for any reason. Any data collected or submitted through this site will not be sold, traded, or otherwise transferred to outside parties. This does not include trusted third parties who assist us in operating our website, conducting our business, or servicing you, so long as those parties agree to keep this information confidential. We may also release your information when we believe release is appropriate to comply with the law, enforce our site policies, or protect ours or others rights, property, or safety. However, non-personally identifiable visitor information may be provided to other parties for marketing, advertising, or other uses. We are committed to ensuring that your information is secure. In order to prevent unauthorized access or disclosure we have put in place suitable procedures to safeguard and secure the information we collect online. The confidentiality of our Client’s business operations are held in the highest regard at INVESTIGATIONS.COM. Our employees are instructed to keep confidential any information that comes to their attention while deployed at a Client’s facility. This includes any and all information relative to the site inspections, interviews conducted, security issues, the final report and any additional information that is considered germane to the Client. Beau Dietl & Associates will handle information and any intelligence that is gathered on the Client in a strictly confidential manner at all times. A cookie is a small file which asks permission to be placed on your computer’s hard drive. Once you agree, the file is added and the cookie helps analyze web traffic or lets you know when you visit a particular site. Cookies allow web applications to respond to you as an individual. The web application can tailor its operations to your needs, likes and dislikes by gathering and remembering information about your preferences. We use traffic log cookies to identify which pages are being used. This helps us analyze data about webpage traffic and improve our website to tailor our customer’s needs. We only use this information for statistical analysis purposes. Overall, cookies help us provide you with a better website, by enabling us to monitor which pages you find useful and which you do not. A cookie in no way gives us access to your computer or any information about you, other than the data you choose to share with us. You can choose to accept or decline cookies. Most web browsers automatically accept cookies, but you can usually modify your browser setting to decline cookies if you prefer. This may prevent you from taking full advantage of the website. 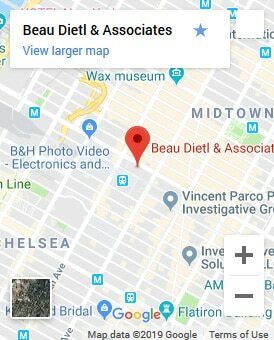 Investigators that are listed on the Investigations.com directory are in no way affiliated with Beau Dietl & Associates. The Investigations.com directory of private investigators makes no guarantee as to the quality of the services provide by any the companies listed.